Sometimes, getting welfare cases resolved can be a lengthy and frustrating process for all concerned, as we have have to work within the complicated realms of French law. The latest good news is that we have had confirmation from the DDSV (17) that the little shetland pony with overgrown feet blogged here has finally been attended to by a farrier. Dealing with welfare cases is a vital part of our work, but they can also use up a lot of our resources with inspections, communications with the authorities, registered letters and legal assistance. 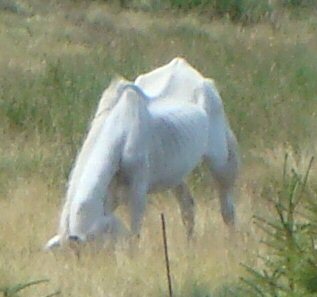 The latest welfare case to be reported to ERF was the plight of this old and extremely thin grey horse. This is now being dealt with the DDSV for that department who we will be corresponding with for updated information.